Under section 45 of the Employees Provident Fund Act 1991 (“EPF Act”), employers are statutorily required to contribute to the Employees Provident Fund (commonly known as the “EPF”), a social security fund established under the EPF Act to provide retirement benefits to employees working in the private sector. The extent of the employers’ obligation to contribute is limited in 2 ways: i) it is made for the benefit of employees only; ii) it is made in respect of employees’ monthly wages. Independent contractors and payments that are not wages are excluded from the purview of the EPF Act. However, as some cases have already shown, the question of who is an employee or whether the monies paid are wages is not easily answered, especially at a time when “gig economy” is increasingly commonplace under which new forms of employment and pay structure are being introduced. When called to resolve these questions, courts will scrutinize all relevant facts and circumstances to uncover the true nature of the subject matter. The labels used by the employer may lend some insight, but they are never conclusive and may in some cases be regarded as mere disguise employed to avoid the employer’s statutory obligations. The recent decision of the High Court is instructive in this regard. In this case, the court held that payments described as “reimbursement” or “travel allowance” that were paid to the employee for trips he made while working in the company as a driver were in fact incentives that are covered under the EPF Act and were subject to EPF contributions. Thus, notwithstanding the labels that used to describe the payments, the employer was still liable to make contributions to the EPF. What constitutes as wages under the EPF Act? any other remuneration or payment as may be exempted by the Minister. That being said, what constitutes as wages may not be straightforward in all cases. Much of this depends on the construction of section 2 of the EPF Act (which defines the word “wages”). Below are some examples of how courts have dealt with questions concerning wages and employers’ liability to contribute to the EPF. Award sums in dismissal cases are granted in the form of backwages, and unless there is an express order by the Chairman of the Industrial Court, employers are not required to make contribution in respect of the award sum. Payments which are made to volunteers do not attract the operation of the EPF Act for the obvious reason that volunteers are not employees. However, where the payments are made with such regularity and in such manner as to resemble employees’ wages, courts may be less inclined to view the recipient of these payments as a volunteer, especially where the facts bear the markings of an employer-employee relationship. Allowance (except travelling allowance) is included in the definition of wages under the EPF Act. However, as the word is broad enough to include payments for food, clothes, accommodation, phone calls, etc., reference can be had to case law to ascertain its scope. Courts will consider factors such as whether the allowances are a fixed sum payable to employees on a regular basis, or whether they are only payable on a reimbursement basis subject to the employee actually incurring the expense. The latter is unlikely to be construed as “wages” that attract EPF contributions. Labels are not conclusive. Employers cannot disguise what is in substance wages as something else in order to avoid their statutory obligations. 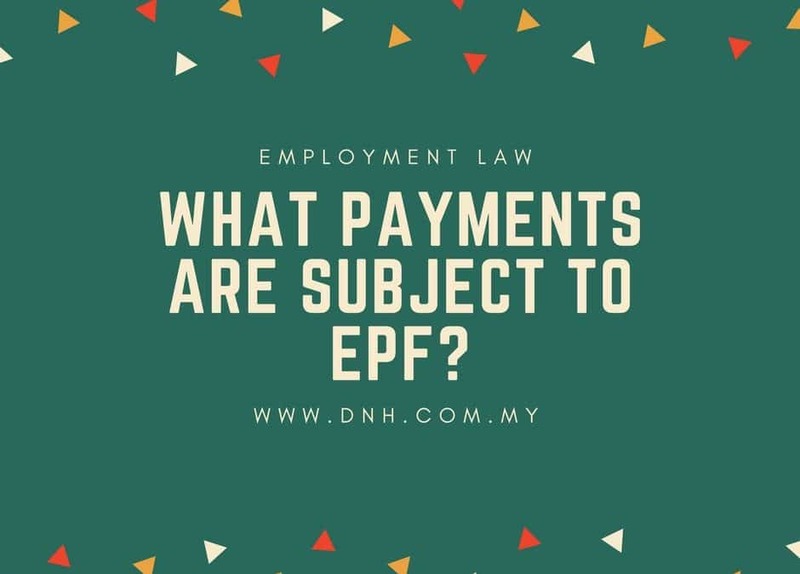 Employers should consult the relevant authorities or a lawyer if in doubt of whether they are required to contribute to the EPF. Failure to comply with the EPF Act is an offence. This article was written by Donovan Cheah (Partner) and Adryenne Lim (Legal Executive). If you have a query, please contact us. Can Employers Give Bad References?